Dr. Mazen Dagher is founder of Chapter2Dental and the owner of Hawkesbury Dental Center, a top tier clinic based in Ontario, Canada since 1999. An expert in implantology and complex dental surgery procedures, he is also the founder of the Dagher Implant Institute, a continuing education training center in implantology for dental professionals. He is currently a KOL with BioHorizons. Olivier Sefler M.B.A. is founder and CEO of Chapter2Dental. A recognized Digital Business Strategist and Marketing Expert, Olivier had a successful corporate career before becoming an entrepreneur. He launched innovative products and services for major companies such as Cogeco, the parent company of Atlantic Broadband, and the 8th largest cable operator in North America. He is the recipient of the Top Under 35 HEC Montreal Leader Award. Dental health and esthetics is dependent on specifically defined relationships between the soft tissue, the teeth or implants, and the underlying osseous scaffold. A critical soft tissue dimension is required for long-term predictable support of the gingival margin, crestal bone and restorative esthetics. Part and parcel of a thorough dental evaluation today is to determine that gingival phenotype of the individual. Thickness of the gingiva, zone of attached tissue and tissue color all play important roles in developing the long-term health and esthetics in dental treatment of any kind. It will teach IN DETAIL and simplify the process of site evaluation, critical anatomy, flap management, incision techniques, suturing and minimally invasive armamentarium. The dental implant surgical and restorative markets are forecasted to reach 12.32 billion by 2021. Such substantial industry growth indicates that many dental hygienists will encounter patients with implant dentistry within their clinical practice. With the increased incidence of peri-implant diseases, studies have indicated the maintenance phase to be the most important aspect for long term success. While protocols for implant maintenance remain unclear, the role of the dental hygienist in the preservation of peri-implant tissues has been recognized internationally. A 2015 consensus report published by the 10th European Consensus Conference (EuCC) addressing peri-implant inflammation acknowledged that detection and prevention of peri-implant diseases is contingent upon the diagnostic and therapeutic skill of the clinician. 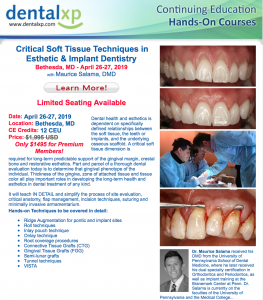 This multifaceted hands-on program will explore the fundamentals of laser science, periodontal endoscopy, subgingival powder streaming with glycine powder and instrumentation in the non-surgical treatment of peri-implant and periodontal diseases. Working with simulation exercises, this workshop is designed to build confidence and gain clinical understanding for dental hygienists’ in the delivery of advanced treatment protocols. Join us. 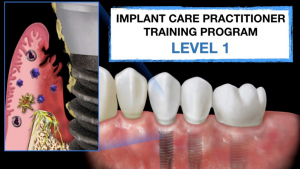 Your journey to become an Implant Care Practitioner (ICP) begins here!